HABIT: White, pink, rose, yellow, or red flowers. Finely textured, succulent groundcover. Easily damaged by foot traffic or pets when the succulent leaves and stems are crushed. Native to Europe and Asia. Sedum ‘Autumn Joy’ is a tall growing perennial with dramatic flowers that are white as they start developing in the summer and end up red in the fall. S. ‘Ruby Glow’ is lower growing and blooms all summer. 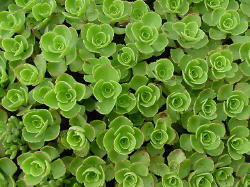 Sedum choices vary widely in size, color and texture. CULTURE: Easy, any soil, prefers well-prepared and drained beds. Best exposure is partial shade. At least one species for every zone.